The flawlessly faceted ametrine discs are pale lavender that shades into delicate yellow. Since both amethyst and citrine are varieties of quartz, it's not surprising to find them growing in the same matrix. The cut on these beads is faintly reminiscent of Swarovski Crystal's fabulous pagoda beads, in that they are fashioned to interlock. 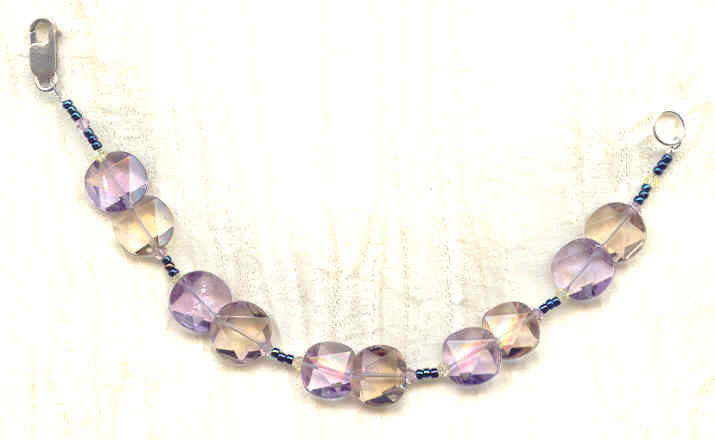 I've put pairs of ametrine beads together, one more lavender, the other more yellow; and flanked them with tiny Swarovski crystal bicones in co-ordinating colours. It's another beautiful bracelet from SPARKLE PLENTY. The incredibly NEAT cranberry-coloured glass drops are flat on the back and have concentric ridges moulded into their fronts. The centerpiece of this luscious pendant necklace is cast sterling silver and features triangular peridot and round amethyst faceted stones.